One of the problems I’ve been struggling with for a while now is the presence of pesky memory leaks in Visual Haskell. Hs2lib has one convention, It doesn’t free any memory, and so you’re responsible for freeing all memory. As far as I knew, I was freeing any and all pointers that I had. It should not be leaking, but yet it was. So I decided to get to the root of this problem. I wrote a simple application that uses the Lexer classes of Visual Haskell and would emulate a user scrolling by feeding it lines of a Haskell file one at a time. WARNING – DebugDiag was not able to locate debug symbols for HsLexer.dll, so the reported function name(s) may not be accurate. HsLexer!HsEnd+1343ac4: 8.20 MBytes worth of outstanding allocations. HsLexer!HsEnd+150ae89: 2.00 MBytes worth of outstanding allocations. So according to this tool, my little program was leaking quite extensively and not surprisingly, it was all coming from my inside my Haskell program. Unfortunately, GHC/GCC can not produce the proper symbols (.pdb files) for any of the Microsoft debugging tools to understand. So while we know conclusively that the program is leaking, we don’t know where. This is where the new version of Hs2lib comes into play. The idea is to track any and all allocations and de-allocations made during the run of the program, in essence a simple profiler. For this reason we now have Debug versions of the of modules. Through the magic of CPPHS, Cabal and custom preprocessors we get the usual “release” modules and “debug” modules which write the allocations to a file. The allocations get written out to a file called “Memory.dump”. From this you can see that not only does it record allocation, but I’ve also implemented a simple artificial stack, that shows us where the allocation is/originated. The current implementation is rather simplistic. I will look into expanding this later, but for now it suits my needs. For those wondering, this tracker is not enabled by default. To enable it just pass the “- -debug” flag to the call to Hs2lib. Compiling with this flag instructs the library to use the Debug version of the libraries, and changes the code generators so that they also add extra information to the generated code. Since de-allocations also have to be tracked, using this flag also exposes a free function which should be used to free pointers. If the CallingConvention used is stdcall then a function “freeS” is exported, if ccall then “freeC” is exported. The reason for this is because these functions are statically defined. They aren’t being generated by the tool but are instead part of the library part of the tool. Once we have a .dump file, the next step is to analyze this information. This is where the new tool Hs2lib-debug comes in. This tool replays the allocations in a pseudo heap. If all goes well, at the end the heap should be empty. If it has any entries it means we’ have a leak. *** Found 1135 outstanding allocation(s). The messy output for the stack is a as follows: Entries in the path are separated by a ;, instead of the usual \ character. This is interesting for a couple of reasons., The profiler is saying that the pointer associated with the CWString (which is defined as a Ptr CWchar) is never freed. But why not. The answer lies in the C# Marshaller and types being used. We are currently Marshalling C# strings using the String datatype. Strings in C# are immutable, so once the marshaller creates a wchar_t* from the string, it never worries about it again. They are strictly an in parameter. C# does have mutable strings, using the StringBuffer type. Using StringBuffer has the benefit that it already is implemented as a char pointer. The marshaller simply passes the pointer to the Haskell function and upon. After the function returns and the GC determines that the StringBuffer is no longer in use, it should free the memory (at least in theory). Make the library just free any CWString it dereferences. For now I’ve chosen the second approach, for no other reason other than it requires the least amount of change in existing code. In the future I’ll adopt the approach that Hs2lib will free any arguments being passed to it. I don’t know if this is the convention usually used. If someone has something against this approach I would love to hear it. Update : There’s somewhat of a big gotcha that I’ve recently discovered. We have to remember that the String type in .NET is immutable. So when the marshaller sends it to out Haskell code, the CWString we get there is a copy of the original. We have to free this. When GC is performed in C# it won’t affect the the CWString, which is a copy. The problem however is that when we free it in the Haskell code we can’t use freeCWString. The pointer was not allocated with C (msvcrt.dll)’s alloc. There are three ways (that I know of) to solve this. use char* in your C# code instead of String when calling a Haskell function. You then have the pointer to free when you call returns, or initialize the pointer using fixed. use StringBuilder instead of String. I’m not entirely sure about this one, but the idea is that since StringBuilder is implemented as a native pointer, the Marshaller just passes this pointer to your Haskell code (which can also update it btw). When GC is performed after the call returns, the StringBuilder should be freed. I’ve once again updated the library to not free any pointers. This prevents a nasty heap corruption. To not get memory leaks in c# you are free to choose between solution 1 & 3 presented here. *** Found 0 outstanding allocation(s). Congratulations, No memory leak(s) detected. And so the memory leaks are fixed. It’s worth noting that the analyzers can be quite slow. It uses a flat LinkedList like structure and lists to do the analysis. I will in future versions be replacing these with a Tree like structure and arrays respectively. As most of you know Visual Haskell makes use of Haskell programs compiled to a dynamic library (dll). This task can be completely automated. This is what Hs2lib provides. Hs2lib (formerly WinDll) was made to facilitate making changes and updates to Visual Haskell’s support files. It was designed for purely that purpose and thus has some limitations and design decisions that reflect this. I’ve been working mostly on getting this to a stable state the last few weeks/months. The one used in the original Visual Haskell used a hack for some things like lists. This one has a stable interface. After this there should be 2 header files and one dll file named Hs2lib.dll in the folder. This name can be changed with the –n flag. Your Haddock documentation is carried over along with the original function type as comments for the new generated functions in the headers. Marshaling data is automatically generated for you for any data structures found during the dependency analysis phase. This can only be done if the source for the data type is available. Since Visual Haskell is written in C# this tool can also output C# code, this is done by using the –c# flag. I’m working on a PDF that goes into much greater detail about this tool and it’s options, But I need to reword some parts of it as I’ve been told it’s too “handholdy” (simplistic) in some parts. So I’ll hold off on publishing that. Types with kind other then * have to be fully applied. (e.g. Maybe String). A specialized Marshaling instance is then generated for each of these instances. Properly supports marshaling of lists. [Int], where the list is an argument becomes CInt –> Ptr Int , getting an explicit size for the list, and where a return value becomes Ptr CInt –> Ptr Int, where it expects a pointer to which to write the size of the list. This introduces a semantic difference between [Char] and String. The former is treated as a list of characters with no explicit terminator, whereas the latter it treated as a Null terminated wide string. Supports Ptr, FunPtr and StablePtr. Which introduces the possibility to have “caches”. Data types with multiple constructors become a union, where data types with a single constructor or a newtype are inlined and treated equally. Avoids unsafePerformIO as much as possible, except for in one specific instance. Code generator generates a bit too many parenthesis for the temporary Haskell file generated. Will fix in future versions. Cannot export functions or types with the same name. The types are imported unqualified. I will work on the pdf documentation in the coming 2 weeks, That should be a complete overview on the abilities of this tool and why I made certain decisions. I will publish a more detailed tutorial later during the day. The monad used determines how many results you receive. Use a Maybe monad and you’ll get just 1. use a List monad and you’ll get more than one, but only if you don’t specify a specific source span to look for (wildcard match on name alone). However we should never enter the PostTcType types inside the renamed AST. These are invalid at this stage. Unfortunately SYB’s listify does not provide a way to tell it not to enter a specific type. 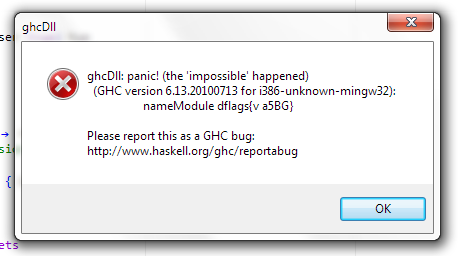 If you think about it, this kind of makes sense, GHCi also won’t produce anything on local variables. In fact you can’t even refer to them. But we would at the least we would like to prevent this crash, and in the best case scenario we would like *some* information on the symbol. After poking around some I noticed that the type of the identifiers that produce the errors are “Internal Name” values. the function nameModule then fails on these types. The plan now is, whenever we find a Internal Name, we look into the TypecheckedModule to find the Id associated with the Name value we retrieved earlier. with SYB this is again easy. However there’s a catch (thanks to nominolo for pointing this out): we should not enter any PostTcKind nor NameSet because these are blank after type checking. The important thing to note here is the Context , it’ll contain a cache of information. So looking up any of this stuff will be instantaneous. You just hover and directly get back information. A last cool but *I’m not so sure how useful* function is that if you select something, then hover over it, it will type check only that expression. And that’s it for this post, I’ll continue the work on Cabal now, or continue this track and fully finish intellisense. This is the preliminary version of the Ghost typing addition to visual Haskell, the idea is that whenever an explicit type signature is not given, the IDE will display the type inferred by GHC. You can then click on the signature to insert it, or use the smart action associated with the name of the function. Up next is the feature that when you have given a signature that doesn’t type check, the IDE will remove that signature and retry, if it succeeds the IDE will display a suggested signature. Below is a GIF of how the first part works. if the function has a type signature it will collapse at the end of that declaration, if not it’ll collapse at the end of the function name. There is a restriction to this however since GHC allows you to declare your signatures anywhere in the file. In order for the signature to be considered part of the function by collapsible regions it has to be end on the line before the binding. Which means it can span multiple lines, the end just has to be before the binding, that way it also supports haddock documented type signatures.